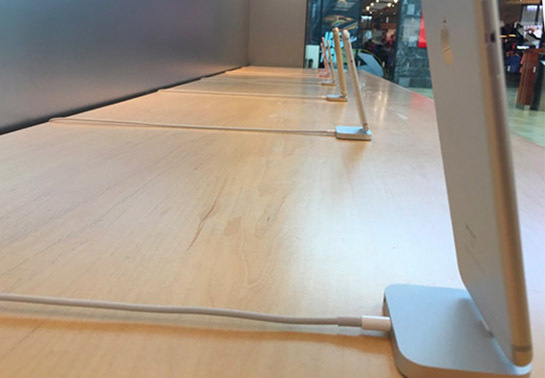 Apple revamped its retail stores last year by removing iPad smart signage and demoting iPod display models to side shelves, and now the company has another move up its sleeves in a push towards simplicity. MacRumors has learned of at least two other stores in the United Kingdom where the security tethers, which activate audible alarms when disconnected, have been removed, and it appears likely the change will be phased in at other locations. Apple says this is to allow people to hold them properly, try cases on them and even see how they feel in your pocket. It's a bold move, especially given the lack of visible security in the building. We couldn't spot a single CCTV camera, although any phone taken out of the store will set off an alarm. If not returned, the phones will also be rendered unusable. 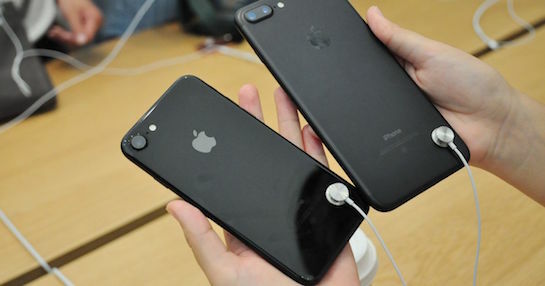 The customers who do attempt to steal iPhone display models, if not caught by security or CCTV cameras where installed, will walk away with unusable devices, as Apple will place them into Lost Mode remotely using Find My iPhone. Apple continues to use security tethers on larger products such as MacBook and iPad display models. Instead they will explode like a Note 7 if you take them out of the store. They should have a self destruct feature. Or did Samsung patent that? Don't take one past the great seal! Good luck trying to steal those. You'll have a dead phone by nightfall. Apple has now made it easier to steal their iPhones from their stores! Gosh! So much courage lately. But no amount of courage on Apple's part can match the courage of people who bought the Galaxy Note 7. .. Kudos to Apple for essentially making a phone that is completely worthless to a thief! Yes I always thought it was a demo version of iOS rather than the proper thing. Maybe they now have an kernel service running that checks the location and when it moves more than 50 meters, it turns into a Note 7 from Samsung. Those security wires always get so messy and tangled. Looked so annoying for employees who would go around and neatly spool up the wire and tuck it below over and over.